Earth is orbiting through a swarm of space debris that may be producing an unusual number of nighttime fireballs. November 3, 2005: "I thought some wise guy was shining a spotlight at me," says Josh Bowers of New Germany, Pennsylvania. "Then I realized what it was: a fireball in the southern sky. I was doing some backyard astronomy around 9 p.m. on Halloween (Oct. 31, 2005), and this meteor was so bright it made me lose my night vision." Bowers wasn't the only one who saw the fireball. Lots of people were outdoors Trick or Treating. They saw what Bowers saw ... and more. Before the night was over, reports of meteors "brighter than a full moon" were streaming in from coast to coast. Astronomers have taken to calling these the "Halloween fireballs." But there's more to it than Halloween. The display has been going on for days. On Oct. 30, for example, Bill Plaskon of Jonesport, Maine, was "observing Mars through a 10-inch telescope at 10:04 p.m. EST when a brilliant fireball lit up the sky and left a short corkscrew-like smoke trail that lasted about 1 minute." On Oct 28, Lance Taylor of Edmonton, Alberta, woke up early to go fishing with five friends. 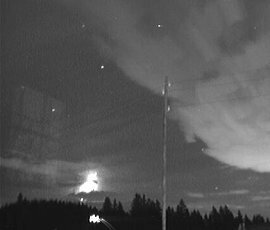 At about 6 a.m. they "noticed a nice fireball. Then 20 minutes later there was another," he says. On Nov. 2 in the Netherlands, "The sky lit up very bright," reports Koen Miskotte. "In the corner of my eye I saw a fireball about as bright [as a crescent moon]." What's happening? "People are probably seeing the Taurid meteor shower," says meteor expert David Asher of the Armagh Observatory in Northern Ireland. Every year in late October and early November, he explains, Earth passes through a river of space dust associated with Comet Encke. Tiny grains hit our atmosphere at 65,000 mph. At that speed, even a tiny smidgen of dust makes a vivid streak of light--a meteor--when it disintegrates. Because these meteors shoot out of the constellation Taurus, they're called Taurids. 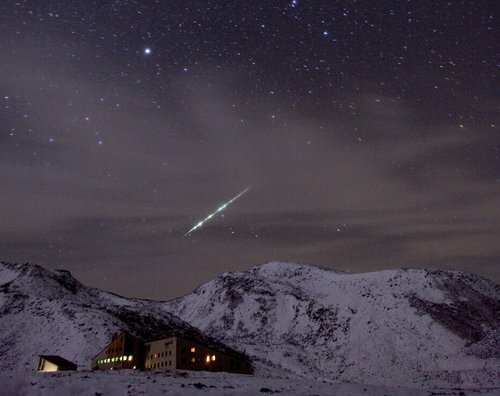 Above: a Taurid fireball photographed Oct. 28, 2005, by Hiroyuki Iida of Toyama, Japan. According to Asher, the fireballs come from a swarm of particles bigger than the usual dust grains. "They're about the size of pebbles or small stones," he says. (It may seem unbelievable that a pebble can produce a fireball as bright as the Moon, but remember, these things hit the atmosphere at very high speed.) The rocky swarm moves within the greater Taurid dust stream, sometimes hitting Earth, sometimes not. "In the early 1990s, when Victor Clube was supervising my PhD work on Taurids," recalls Asher, "we came up with this model of a swarm within the Taurid stream to explain enhanced numbers of bright Taurid meteors being observed in particular years." They listed "swarm years" in a 1993 paper in the Quarterly Journal of the Royal Astronomical Society and predicted an encounter in 2005. According to the International Meteor Organization, the Taurid shower peaks between Nov. 5th and Nov. 12th (details). "Earth takes a week or two to traverse the swarm," notes Asher. "This comparatively long duration means you don't get spectacular outbursts like a Leonid meteor storm." It's more of a slow drizzle--"maybe one every few hours," says Asher. The Taurids -- details from the International Meteor Organization. Scroll down the page to "Taurids."